Start your engines everyone! The high-tech animated racecar of the 1960s, the Mach 5, and its driver Speed Racer are heading to the big screen for a live-action adaptation. If you can believe it, the project’s actually been in the works for over 15 years. At various times, Johnny Depp was scheduled to play the title role, Vince Vaughn was cast as Racer X and Marc Levin, Jennifer Flackett, J. J. Abrams, Patrick Read Johnson, Julien Temple were all connected. Now that it’s finally on the road, the current incarnation looks like it will be a true star-studded event. Emile Hirsch will star as the heroic Speed with Christina Ricci (The Addams Family) as his faithful girlfriend Trixie. John Goodman (The Flintstones) will play bombastic racecar builder and Speed’s father Pops and Academy Award-winner Susan Sarandon will play Speed’s Mom. 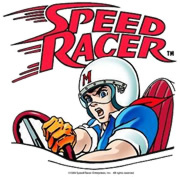 Casting is still underway for the role of Speed’s rival, Racer X. Unfortunately, there’s been no mention of casting of team mechanic Sparky, Speed’s younger brother Spritle or the pivotal role of Chim-Chim the monkey. C’mon, what would Speed Racer be without them? High-definition filming on Speed Racer is expected to begin on June 5th in Berlin. A May 9, 2008 release is planned. Stay tuned! Speed Racer: Wow! Check Out the New Movie! Speed Racer: The Race for May 2008 Begins!